Women all around the world are beginning to realize that being spiritually connected is their key to happiness and abundance. As they connect to Spirit, they listen and trust, and begin to realize their true value. When connected to Spirit, they find that magic happens and prosperity flows. Women are spearheading our future. And spiritual women are leading the way. They’re "tapped in" and they’re using their innate gifts to serve the world. Spiritually empowered women aren’t concerned with getting ahead at the detriment of others. They won't do jobs or perform services just for the money. Neither can they take unconscious advantage of the Earth's natural resources and her inhabitants. That was the old way. The new way is feminine. It is full of collaboration, community, creativity, fostering, nurturing and supporting one another. They realize their body always knows the truth. They tap their femininity, intuition, softness, gut feelings and embody their nurturing essence. They use tools like yoga and meditation to move their awareness from their head to their heart. They also nurture themselves with massages, hot baths, and eat healthy meals. Within their body is where the deepest part of their essence abides. And the freer they feel to trust themselves the more they develop the courage the change themselves and to change and serve others. They don’t wait until they finish the next course, or book, or work their way up to a six figure income. Spiritually empowered women begin living their dream life, now. They question that little voice that says “you’re not ready yet.” They instinctively know that if they don't love what they do, no amount of money will make them love it. Each spiritually empowered woman has a unique purpose here on earth. That purpose becomes their passion and their service to the world. They do what they love, and they do it NOW! They are fully aware that the world needs the gifts that only they have. This enables them to raise their energetic vibration through living in alignment and balance with their Spirit. They remain open, willing, tolerant and forgiving. They set intentions daily that re-affirm their deepest commitment to living a spiritually infused life. By creating daily rituals they reinforce and ignite their spirit. They familiarize themselves with their innermost thoughts and beliefs; those separate from their family, friends or partner. They challenge their fearful and limited beliefs, consciously releasing the past. By aligning with like-minded souls who nurture, inspire, encourage, support, they are able to remain accountable. They may join a women's circle or brainstorming group. They might attend community events at a yoga studio. They learn to uplift and empower other women. Spiritually empowered women see other women's success and beauty as proof of their own potential. Spiritually empowered women are not afraid to step out of their comfort zone. They don't feel the need to wait to be praised, discovered, or validated by another. They don't worry about what other people think. Oftentimes they don’t follow another’s path but instead clear their own path by walking it courageously. 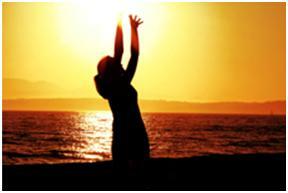 Spiritually empowered women strive to be living fully in the present moment. They have learned to love themselves without judgment or undue criticism. They surrender their desires and thoughts and reunite with the love essence that is always within. They share, serve, and smile and the Universe rewards them for it.